It all depends on how you approach a place. You can rush it or you can take it slow, watch the beauty that surrounds you and take a deep breath. Perhaps you can pause for a second before you arrive – just have a look around you and enjoy the anticipation. Then you will take the final steps to your destination and – finally arrive, knowing that the time you will spend there will be your reward. I think that this is the way you should approach the so-called Bergsteigerdörfer – or mountaineering villages. These 18 villages or small towns are scattered over eight of the nine Austrian provinces (all except Vienna). They combine mountain tourism with sustainability, fun with responsibility, and even complement this combination with high-quality offers for visitors. Take for example the village of Ginzling. Tucked away at the very head of the Zillertal Valley, it offers a striking contrast to the hustle and bustle of the skiing resorts that characterize the rest of the valley. Or take Reichenau in the east of Austria, where Sigmund Freud used to spend his summer holidays and enjoy mountain hikes. Or maybe you could visit Mauthen in Austria's “deep south,” where some of the fiercest battles of World War I were once being waged between the Hapsburg armies and the Italian king. A terribly embattled frontier not even a hundred years ago, it is scarcely noticeable today. Now, even the forbidding rocks on the border are marked by a secured climbing route called: via ferrata senza confine – the via ferrata without borders. Visiting the villages is highly recommended. Simply put, you can't go wrong with a mountaineering village! This summer the villages have also started operating their web pages in German and English, so don't wait. You can check them out at: http://www.mountainvillages.at. The mountaineering villages serve as a leading example for environmentalists by putting into practice the ideas and concepts of sustainable tourism. 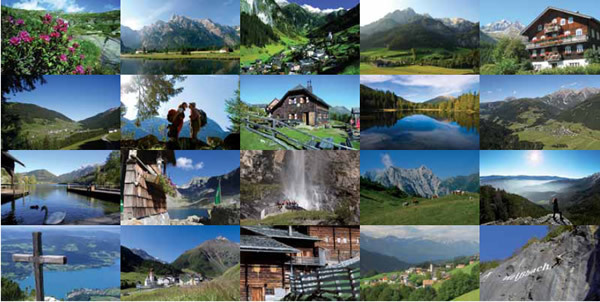 The entire project has been initiated by the Austrian Alpine Society (Oesterreichischer Alpenverein). According to its main proponent, Peter Hasslacher – the Alpine Society's person in charge of environmental protection and sustainable development – Mountaineering Villages are a prime example of how to live up to the commitments made by the Alpine Convention. By the 1990s, it had become clear to the Alpine states that something had to be done to ensure that future generations would also be able to live as well as work in and enjoy the Alps to the fullest. Hence, they got together and agreed to pass an international legal framework for the protection and sustainable development of this magnificent, yet vulnerable region, which is shared by Austria, Slovenia, Switzerland, Italy, Liechtenstein, France and Monaco, with Austria having the biggest share of the Alps. The Convention aims at achieving the best possible protection of the Alps while at the same time allowing for sustainable economic opportunities. Projects like the Mountaineering Villages prove that this is not mere rhetoric, but that it actually works. Enterprises that are located in that region are usually small-scale, its mountain refuges enjoy a high level of maintenance, construction is done in an environmentally sound manner that fits into the local surroundings, public transportation facilities are being maintained and constantly improved, and – last but not least – mountaineering villages offer you high-quality service, spectacular landscapes, excursions into wild Alpine areas, and expeditions into the history of mountaineering. To put it in a nutshell: Go visit!